Dr. Villarruel is the Margaret Bond Simon Dean of Nursing at the University of Pennsylvania School of Nursing and Director of the School’s WHO Collaborating Center for Nursing and Midwifery Leadership. 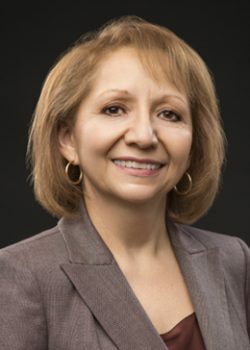 As a bilingual and bicultural nurse researcher, Dr. Villarruel has extensive research and practice experience with diverse Latino and Mexican populations, and health promotion and health disparities. She incorporates a community-based participatory approach and has been the PI/Co-PI of over eight randomized clinical trials on reducing high risk behaviors in teens. She developed one such program to reduce sexual risk behavior among Latino youth – entitled Cuídate! which is disseminated nationally. Additionally, Dr. Villarruel has assumed leadership in many national and local organizations. She is a charter member of the Secretary of the Department of Health and Human Services’ Advisory Council on Minority Health and Health Disparities. She currently chairs the IOM Roundtable on the Promotion of Health Equity and the Elimination of Health Disparities. She is a member of the Strategic Advisory Council of the AARP/RWJ Center for Health Policy Future of Nursing Campaign for Action and co-chairs the Diversity Task Committee. She has received numerous honors and awards including membership in the Institute of Medicine and selection as a Fellow in the American Academy of Nursing. Villarruel earned her BSN from Nazareth College, an MSN from the University of Pennsylvania and her PhD in nursing from Wayne State University. She is a registered nurse in both Michigan and Pennsylvania.